After a hectic month bouncing around Panama, I’m left feeling incredibly inspired by the educational leadership and visionaries in Panama City, the community engagement and sharing in San Miguel, and the thriving jungle-tough students in Kalu Yala. The badass females leading the charge on education reform in Panama were incredibly open, inspiring, and dedicated to making change. Debbie Psychoyos (founder of Fundación ProEd), better known as the mother of all educators, acts as a mentor and role model. She is intelligently pushing forward educational reform in the communities, focusing on the basics - like literacy, and is launching PROJECT CARE, through which they focus on one school in the community to do nothing but show how much they care about every single detail: from the soap in the bathroom, to the curtains in the principal’s office, to acting as partners in the classroom. Marilu Salvador, former teacher and current national director for basic education at the Ministry of Education in Panama, is an education strategist and taskmaster, having to manage everything from the the small stuff - help! I have rats in my classroom - to the big stuff - How might we design for accountability in this system? She’s operating fast, trying to focus on the big strategic goals, while supporting burgeoning innovative projects, like HATCH NextGen, which brings Panamanian creative mentors to rural schools in order to give students access and create broader possibilities. No doubt, Meduca, the Panamanian public school system has a long way to go, but they have open-minded innovators at the helm. Currently, many teachers in Panama only have basic high school education before they are put back into the classroom as teachers. It’s a place ripe for change, and for collaboration with a future Kalu Yala Academy. It’s exciting. Dixie holding one-on-one project check-in meetings with a student on the tree-swing. Dixie Hendley, the health and wellness and education director in San Miguel, has established a meaningful relationship with the local community, offering transient Kalu Yalu institute students access to the community, for example, by teaching English at the local school or volunteering at the health clinic, and generally paseando to stay connected to their neighbors. The students in San Miguel focusing on health and wellness and education. They invite members of the community to weekly dinners, at one of which I met former school principals and the Kalu Yala ‘abuelos’, who gifted me a hand-carved plate. One day I hope to do the same, and return to learn embroidery skills from Aromelia, in exchange for teaching her some of my metal-working skills. We hop on the local bus to take us to the library. 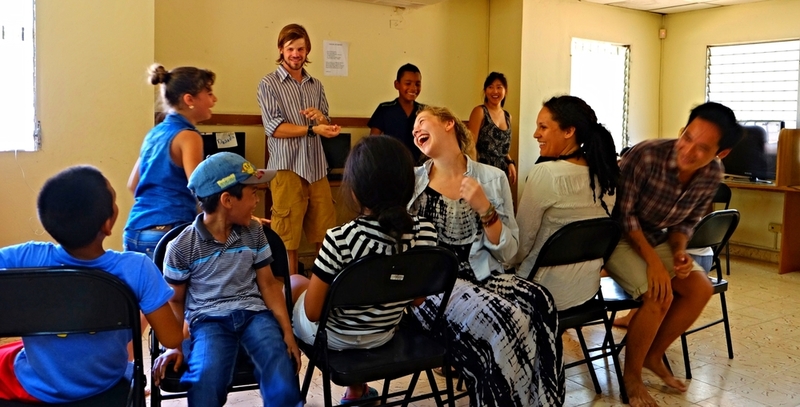 It’s summertime in Panama, and the library offers the only activities for the students. The librarians are incredibly open and excited to have the Kalu Yala students working in the libraries…the only ‘summer camp’ for the students. Because families, and kids, aren’t yet living at Kalu Yala, there is a unique opportunity to begin testing a series of prototypes that will ultimately define the physical and pedagogical structure of the town school. Jungle Survival Tip: Never leave home without your markers. Brainstorming jungle-style with ed-superstar Bethany Halbreich and upcoming ed extraordinaire and current student, Aleiya Evison. With the help of some amazing collaborators, we were able to create a prototype vision for the school as well a series of experiments and provocations to elicit feedback. What if Kalu Yala funded a Tiny Schools Project to incubate a pop-up school? Part-time city/part-time jungle? What if Kalu Yala partnered with the Ministry of Education to run a Panamanian version of a Tiny Schools Incubator? What if Kalu Yala Academy partnered with the Kalu Yala hospitality institute to offer parent/student summer programming? What if Kalu Yala premiered ‘student + parent’ courses? At Kalu Yala, the teachers will be the designers, building a curriculum grounded in design thinking principles for student development, and will actively use the process themselves to design, iterate, and improve their classrooms, processes, and opportunities for parent participation. If jungle living, community building, and cultivating socially-responsible citizens of the world speaks to you, then you probably want your kids to go to school there, or, want to teach there yourself. If this describes you, get in touch!